Alfresco announced yesterday at IBM Lotusphere 2010 in Orlando integration of Alfresco with IBM's Lotus Quickr, Lotus Notes, Lotus Connections and Websphere Portal. Alfresco has named the integration Alfresco Content Services for Lotus, and it is scheduled to be available in Spring 2010. The announcement described it as "economical, scalable and open." Although it isn't clear exactly how long it took to pull off the integration of the two products, press releases boast that they managed to do it within 'record time', attributing much of their speedy development to the use of REST Web Services and CMIS, the new Content Management Interoperability Services standard, something which both Alfresco and IBM have been pushing hard for. The CMIS standard (or more correctly, soon-to-be standard) has the potential to be the enabler for a whole new category of Content Management (CM) applications -- integrated collaborative content management (ICCM), ones that can blend data and information from multiple data sources, which could enable collaboration between users regardless of the exact collaboration tools that are being used. "Lotus Quickr users can manage, store and retrieve documents, and kick off transformations and workflows through Alfresco without having to change anything on the front end," says John Powell, president and CEO of Alfresco. Clearly Alfresco is aiming at Microsoft with this announcement. 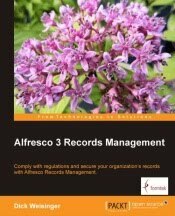 John Newton, Alfresco's CTO called the combination of Alfresco with IBM Lotus a "real SharePoint killer". And that brings up the question of 'why Alfresco' and not IBM's own FileNet. Actually IBM already has a FileNet integration with Lotus. Kathleen Reidy, 451 Group senior analyst said that Alfresco is being positioned as a leaner and lighter-weight option than FileNet. "IBM can't tell customers evaluating Lotus vs. [Microsoft] SharePoint that they need to use FileNet if they want ECM. That is what this Alfresco integration says to me," she says. But the decision to add Alfresco must be causing some concern within IBM's FileNet group.